Bliss balls have become my new favourite snack! They are easy to make and are packed with raw, delicious, nourishing ingredients. Add some Maca powder and you have the perfect energizing snack that can be enjoyed by the whole family. Maca is a root from Peru that grows high in the Andes. It has been used for centuries for nutrition, to enhance stamina and improve fertility. Maca is an adaptogen which helps us adapt to stress for improved energy, resilience and vitality. Studies have indicated that Maca improves a sense of well-being and has positive effects on mood. It is thought to support hormone balance, improve libido and boost fertility in both men and women. This superfood is a nutritional powerhouse. It is rich in minerals (calcium, magnesium, potassium, iron, selenium, zinc), vitamins (B1, B2, C and E), essential fatty acids, sterols, protein and fiber. In a food processor mix dry ingredients first, then add wet ingredients. Mix until nice and smooth. Roll into balls and coat with coconut if desired. Store in fridge or freezer. 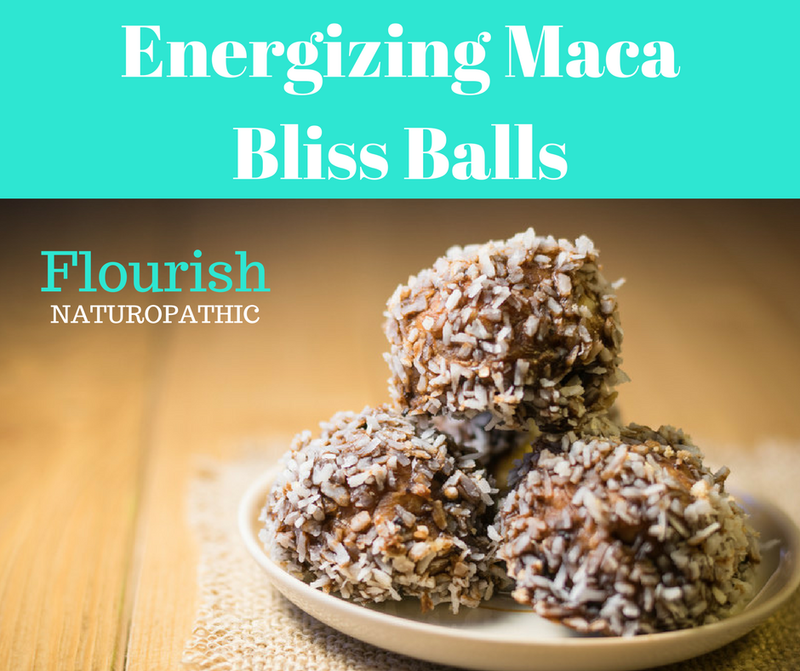 These protein rich bliss balls make a perfect afternoon snack to support energy and vitality. Enjoy!